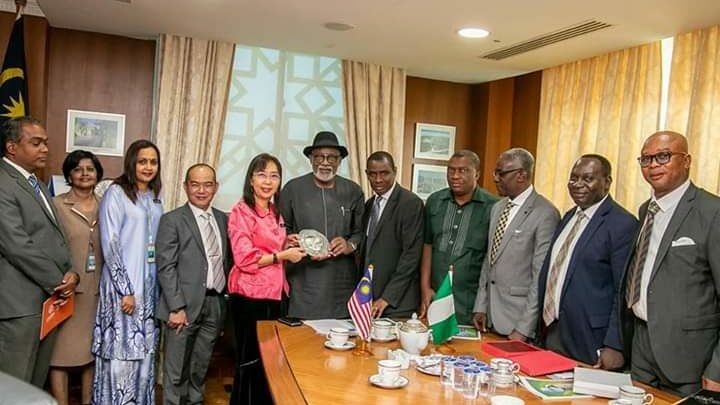 Ondo State governor, Arakunrin Oluwarotimi Akeredolu, SAN, has met with the Malaysian government to woo investors into the abundant agricultural, commercial and industrial potentials of the state. Governor Akeredolu who led the Ondo State Development and Investment Promotion Agency (ONDIPA) team met with the Minister of Primary Industries of Malaysia, H. E Mdm. Teresa Kok on Ondo State Agribusiness & Value Chain Development. Among the team are the Special Adviser to the Governor on Investment, Mr. Boye Oyewumi and the Senior Special Assistant to the Governor on Agric and Agric Bussiness, Pastor Akin Olotu. The Governor who showcased the agricultural potential of Ondo state, especially the primary Industries : Palm oil, Rubber, Timber, Cocoa, Pepper and Cashew with focus on plantations, partnerships, reviving moribund industries through joint ventures, palm oil refineries and technical cooperation. The Governor is on a business tour to Malaysia under the window of the Nigerian-Malaysian Trade Corridor themed “ONDO STATE OPEN FOR BUSINESS” which was organized by the Nigerian-Malaysian Business Council NMBC headed by Dr. Michael Oladipo Aderohunmu who is the President of the council. The Bussiness tour is to encourage Government to Government (G2G) and Business to Business (B2B) and other collaborations between Ondo State and Malaysia.